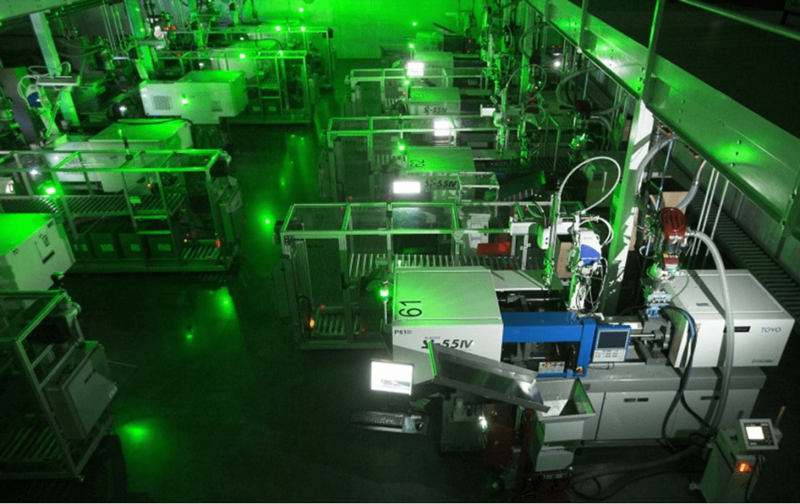 Lights-out manufacturing refers to factories that operate autonomously and require no human presence. These robot-run settings often don’t even require lighting, and can consist of several machines functioning in the dark. While this may sound futuristic, these types of factories have been a reality for more than 15 years. Famously, the Japanese robotics maker FANUC has been operating a “lights-out” factory since 2001, where robots are building other robots completely unsupervised for nearly a month at a time. To imagine a world where robots do all the physical work, one simply needs to look at the most ambitious and technology-laden factories of today. For example, the Dongguan City, China-based phone part maker Changying Precision Technology Company has created an unmanned factory. Everything in the factory — from machining equipment to unmanned transport trucks to warehouse equipment — is operated by computer-controlled robots. The technical staff monitors activity of these machines through a central control system. Where it once required about 650 workers to keep the factory running, robot arms have cut Changying’s human workforce to less than a tenth of that, down to just 60 workers. A general manager for the company said that it aims to reduce that number to 20 in the future. As industrial technology grows increasingly pervasive, this wave of automation and digitization is being labelled “Industry 4.0,” as in the fourth industrial revolution. So, what does the future of factories hold? Product R&D: A look at how platforms are democratizing R&D talent, the ways AI is helping materials science, and how the drafting board of tomorrow could be an AR or VR headset. 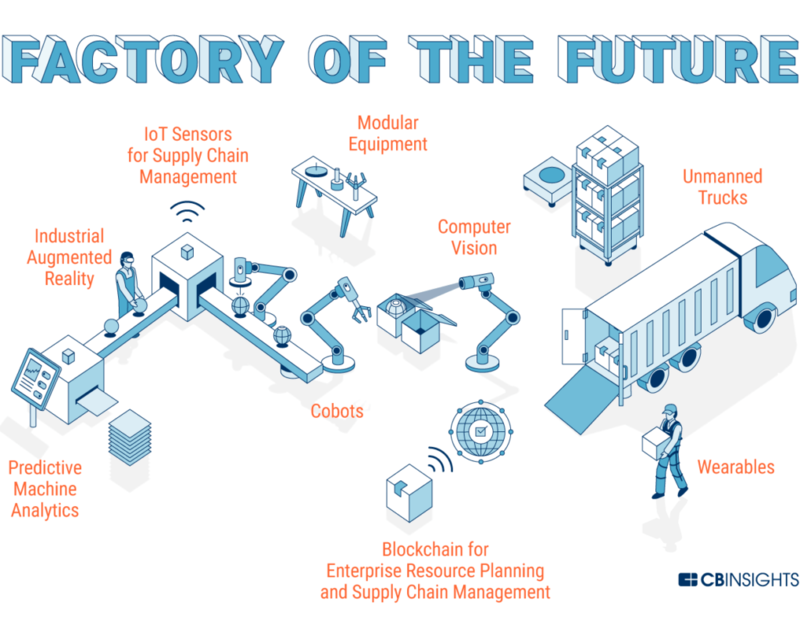 Resource Planning & Sourcing: On-demand decentralized manufacturing and blockchain projects are working on the complexities of integrating suppliers. Operations Technology Monitoring & Machine Data: A look at the IT stack and platforms powering future factories. First, factories will get basic digitization, and further along we’ll see greater predictive power. Labor Augmentation & Management: AR, wearables, and exoskeletons are augmenting human capabilities on the factory floor. Machining, Production & Assembly: Modular equipment and custom machines like 3D printers are enabling manufacturers to handle greater demand for variety. Quality Assurance (QA): A look at how computer vision will find imperfections, and how software and blockchain tech will more quickly be able to identify problems (and implement recalls). Warehousing: New warehouse demand could bring “lights-out” warehouses even faster than an unmanned factory, with the help of robotics and vision tracking. Transport & Supply Chain Management: Telematics, IoT, and autonomous vehicles will bring greater efficiency and granularity for manufacturers delivering their products. Manufacturers predict overall efficiency to grow annually over the next five years at 7x the rate of growth seen since 1990. And despite representing 11.7% of US GDP and employing 8.5% of Americans, manufacturing remains an area of relatively low digitization — meaning there’s plenty of headroom for automation and software-led improvements. Manufacturing is deeply changing with new technology, and nearly every manufacturing vertical — from cars, to electronics, to pharmaceuticals — is implicated. The timelines and technologies will vary by sector, but most steps in nearly every vertical will see improvement. Read on for a closer look at how technology is transforming each step of the manufacturing process. From drug production to industrial design, the planning stage is crucial for mass-production. Across industries, designers, chemists, and engineers are constantly hypothesis testing. Will this design look right? Does this compound fit our needs? Testing and iterating is the essence of research and development. And the nature of mass-production makes last-minute redesigns costly. 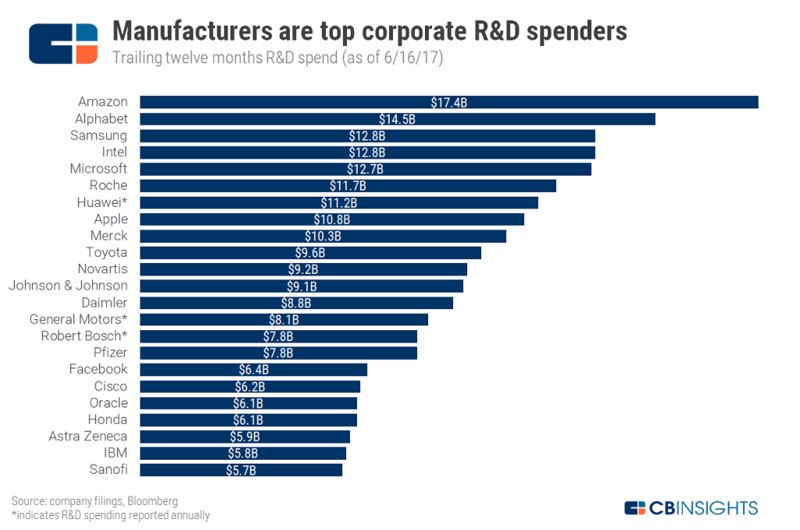 Major corporations across drugs, technology, aerospace, and more pour billions of dollars each year into R&D. General Motors alone spent upwards of $8B on new development last year. In the highly-scientific world of R&D, high-caliber talent is distributed across the globe. Now, software is helping companies tap into that pool. When it comes to networking untapped talent in data science and finance, platforms like Kaggle, Quantopian, and Numerai are democratizing “quant” work and compensating their collaborators. The concept has also aleady taken off with pharmaceutical R&D, though it’s growing elsewhere as well. On-demand science platforms like Science Exchange are currently working across R&D verticals, and allow corporations to quickly solve for a lack of on-site talent by outsourcing R&D. While R&D scientists may seem non-essential to the manufacturing process, they are increasingly critical for delivering the latest and greatest technology, especially in high-tech manufacturing. Companies are exploring robotics, 3D printing, and artificial intelligence as avenues to improve the R&D process and reduce uncertainty when going into production. But the process of hypothesis testing has room for improvement, and tightening iteration time will translate to faster and better discoveries. Accelerating product development is the No. 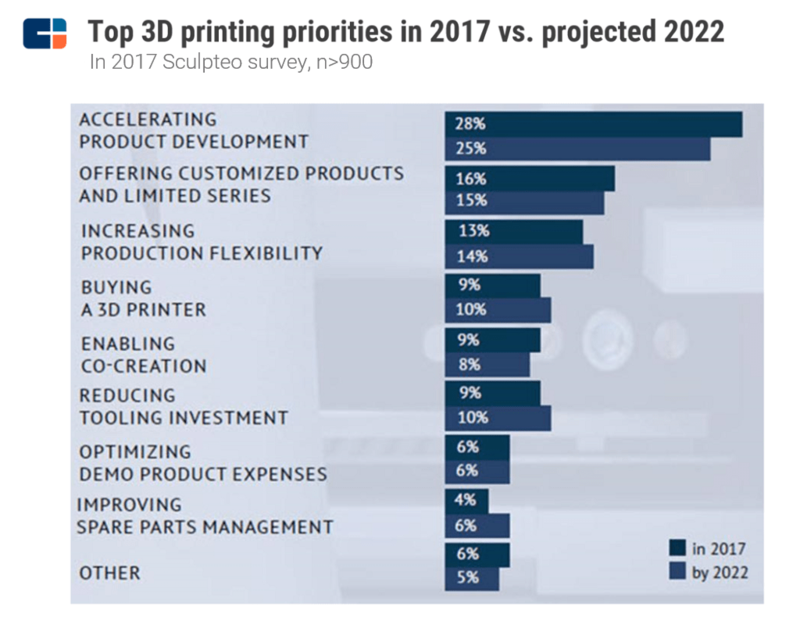 1 priority for firms using 3D printing, according to a recent industry survey. Moreover, 57% of all 3D printing work done is in the first phases for new product development (i.e. proof of concept and prototyping). 3D printing is already a staple in any design studio. Before ordering thousands of physical parts, designers can us 3D printing to see what a future product looks like. Similarly, robotics is automating the physical process of trial-and-error across a wide array of verticals. In R&D for synthetic biology, for example, robotics making a big impact for companies like Zymergen and Ginkgo Bioworks, which manufacture custom chemicals from yeast microbes. Finding the perfect microbe requires testing up to 4,000 different variants concurrently, which translates to lot of wet lab work. Using automatic pipette systems and robotics arms, liquid handling robots permit high-throughput experimentation to arrive at a winning combination faster and with less human error. Below is the robot gene tester Counsyl (left), used for transferring samples, and Zymergen’s pipetting robot (right) for automating microbe culture testing. Looking beyond biotech, material science has played a pivotal role in computing and electronics. Notably, chip manufacturers like Inteland Samsung are among the largest R&D spenders in the world. As semiconductors get ever-smaller, working at nanoscale requires precision beyond human ability, making robotics the preferred option. Tomorrow’s scientific tools will be increasingly more automated and precise to handle micro-scale precision. The spirit of Edison persists in today’s R&D labs, although R&D is still less digitized and software-enabled than one might expect (the National Academy of Sciences says developing new materials is often the longest stage of developing new products). Better digitization of the scientific method will be crucial to developing new products and materials and then manufacturing them at scale. Currently, the hottest area for deals to AI startups is healthcare, as companies employ AI for drug discovery pipelines. Pharma companies are pouring cash into startups tracing drug R&D such as Recursion Pharmaceuticals and twoXAR, and it’s only a matter of time until this takes off elsewhere. One company working in chemistry and materials science is Citrine Informatics (below, left). Citrine runs AI on its massive materials database, and claims it helps organizations hit R&D and manufacturing milestones 50% of the time. Similarly, Deepchem (right) develops a Python library for applying deep learning to chemistry. In short, manufacturers across sectors — industrial biotech, drugs, cars, electronics, or other material goods — are relying on robotic automation and 3D printing to remain competitive and tighten the feedback loop in bringing a product to launch. Currently, manufacturers of all types rely on prototyping with computer aided design (CAD) software. In future manufacturing processes, augmented and virtual reality could play a greater role in R&D, and could effectively “abstract away” the desktop PC for industrial designers, possibly eliminating the need for 3D printed physical models. Autodesk, the software developer of AutoCAD, is a bellwether for the future of prototyping and collaboration technology. The company has been no stranger to investing in cutting-edge technology such as 3D printing, including a partnership with health AI startup Atomwise on a “confidential project.” Recently, Autodesk’s exploration into making an AR/VR game engine foreshadows the larger role it envisions for immersive computing in the design process. Autodesk’s game engine, called Stingray, has added support for the HTC Vive and Oculus Rift headsets. Additionally, game and VR engine maker Unity has announced a partnership with Autodesk to increase interoperability. Similarly, Apple has imagined AR/VR facilitating the design process in combination with 3D printing. Using the CB Insights database, we surfaced an Apple patent that envisions AR “overlaying computer-generated virtual information” onto real-world views of existing objects, effectively allowing industrial designers to make 3D-printed “edits” onto existing or unfinished objects. The patent envisions using AR through “semi-transparent glasses,” but also mentions a “mobile device equipped with a camera,” hinting at potential 3D printing opportunities for using ARKit on an iPhone. 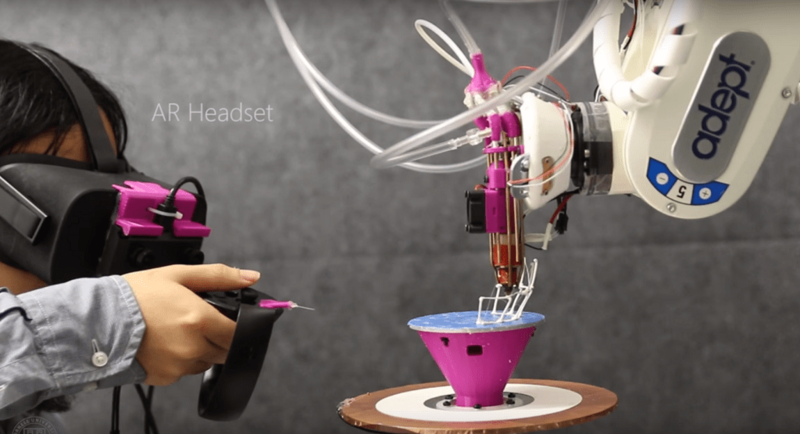 A researcher at Cornell has recently demonstrated the ability to sketch with AR/VR while 3D printing. Eventually, the human-computer interface could be so seamless that 3D models can be sculpted in real time. Tomorrow’s R&D team will be exploring AR and VR, and testing how it works in combination with 3D printing, as well as the traditional prototyping stack.